Broadcasters have long dreamed of complete flexibility and ultimate mobility for remote broadcasts without having to lug around unwieldy racks of gear or clumsy setups too difficult to configure in the field. ACCESS Portable Classic delivers in a sleek, compact, handheld unit capable of sending mono, stereo or dual mono audio over POTS, DSL, Cable, Wi-Fi, 3G cellular (EVDO/UMTS), satellite - plus some services you may not have even heard of. 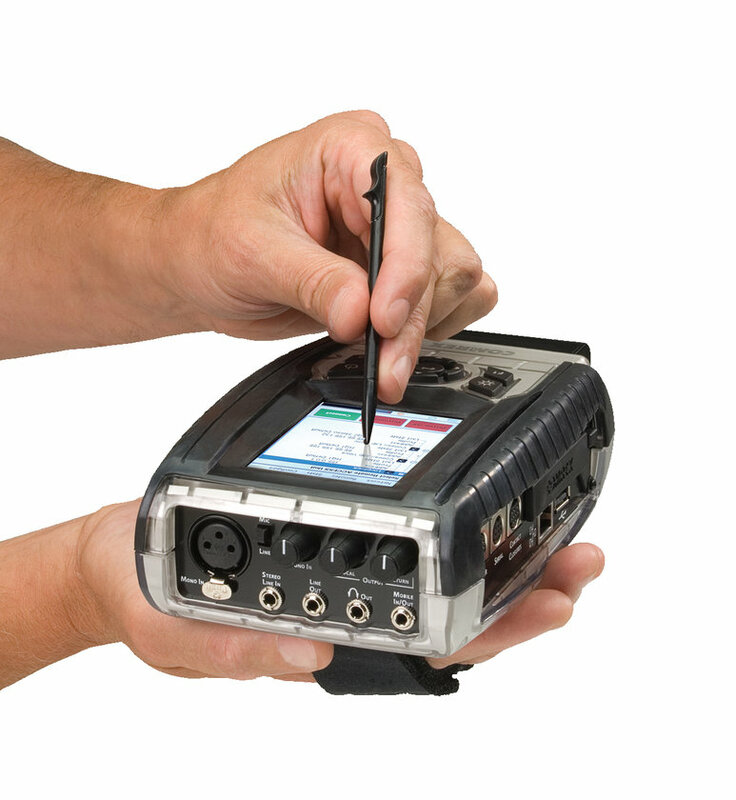 ACCESS Portable Classic was designed for fast and easy connections in the field via a wide variety of data connections regardless of whether in the hands of "non-technical" personnel or seasoned remote "road warriors." Complete with a 7-hour Lithium-Ion battery with built-in charger and combined with an integrated CardBus slot for wireless IP cards and modems, ACCESS Portable Classic will allow you connect from virtually anywhere ! Your remotes will never be the same. *Wired Ethernet Networks - Cable, DSL, T1, T3, etc. *Use ACCESS to make a POTS-to-POTS connection. 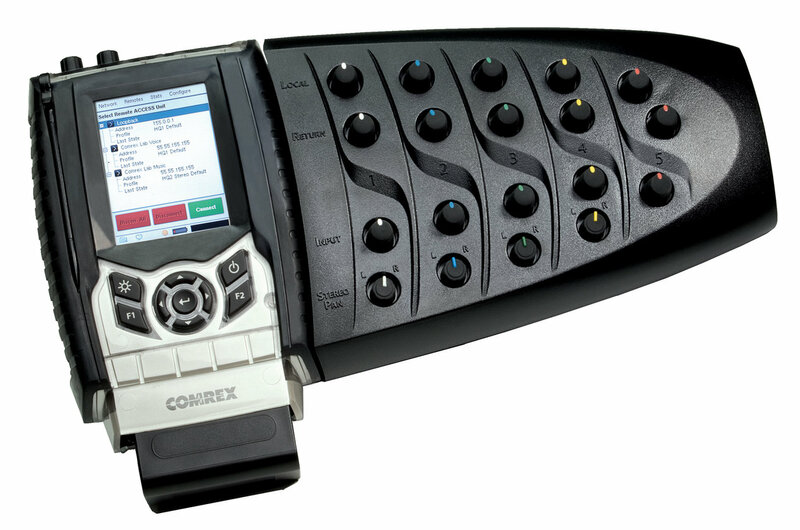 Dial up a Comrex POTS codec (including Matrix, Vector or BlueBox). *You can deliver 15 kHz Stereo on a single POTS line when connecting to another ACCESS. BRIC technology can also deliver wideband audio over 3G cellular data networks like EVDO and UMTS, as well as the increasing number of publicly available Wi-Fi hotspots. ACCESS Portable Classic has a built-in CardBus slot for easy connection to data cards supporting these services. For a list of tested 3G wireless cards, click here. OK, that may be overstating the case a little bit, but there has never been an IP codec as easy to use as ACCESS. ACCESS Portable Classic is designed for fast and easy connections, no matter what kind of IP circuit you have available. 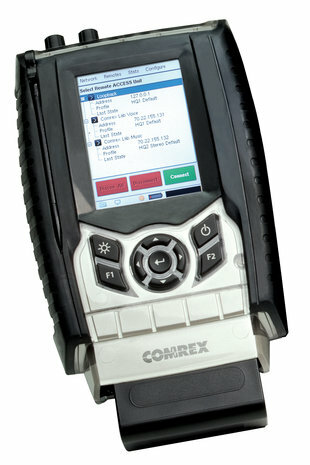 The integrated PDA-style screen will guide even your most "non-technical" user through the simple steps required to connect. And even if that proves too challenging, ACCESS Portable Classic can be preconfigured to auto connect on "power up" thereby minimizing setup time in the field. Using BRIC technology means you won’t have to mess with ACCESS advanced settings. The sophisticated engine of ACCESS is clever enough to assess circuit conditions and adapt on the fly without user intervention. ACCESS is constantly working to compensate for deficits in the quality of service, so no one has to hear how bad the public Internet can be. For the technically advanced, the menus are there. So, if you are a power user, you can configure ACCESS to be whatever you need. You can increase the delay cushion or twiddle the "frames per packet" to your heart’s content. But isn’t it great to know that you probably will never need to ? Whatever the audio transmission job, whatever the circuit, ACCESS has a mode for you. From linear mono or stereo audio to an ultra-low bit rate algorithm, there is a wide range of audio choices to fit virtually any programming need. AND A LOT OF ACCESSORIES..
MPEG-4 AAC algorithms, licensed by Fraunhofer IIS offer the best audio quality for your remote broadcasts. BRIC Traversal Server is the answer to your network issues. It uses our TS servers to negotiate codec connections and traverse NATs and firewalls. The ACCESS Mixer provides 5 additional channels of balanced inputs, outputs and mix controls. Durable travel case, perfect for carry-on or shipping. Multiple foam inserts available. The rapid charger is the perfect stand-alone charger for your ACCESS Portable batteries. 12V DC power adapter for use with ACCESS Portable, BlueBox and Matrix Portable. The Option Icon 322 is a global 3G USB adapter with tri-band UMTS/HSDPA compatibility. Connect to your ACCESS or BRIC-Link from your Android phone for quick broadcasts. Provides high-quality, wideband audio. Easy-to-use Windows application for updating, configuring and installing licenses on your ACCESS and BRIC-Link codecs. Establish connections and control multiple ACCESS and BRIC-Link codecs at the same time from your Windows desktop.